There are many problems with the models and hypotheses that are used to support the naturalistic story of how the solar system formed. Many scientific papers are written each year about the Oort Cloud, its properties, its origin, its evolution. Yet there is not yet a shred of direct observational evidence for its existence. —Carl Sagan and Ann Druyan, Comets (New York, New York: Random House, 1985), p. 201. The naturalistic story of the solar system goes back 4.5 billion years. In this view the solar system began as a cloud of dust and gas that collapsed on itself. A star began to form as the cloud was compressed by some unknown force. As the star spun and collected more mass, a disk of dust began to form the planets. Over millions of years the young solar system was formed. Much debris was left over from the process and is present today as asteroids and large belts and clouds of material. There was no intervention by a Creator, as the physical laws of the universe are adequate to explain everything—or so say the evolutionists. The Bible reveals a much different story, and there are many problems with the models and hypotheses that are used to support the story described above. Artists’ depictions of the events make them look real, but they are just a story to explain why God is not necessary. Among the problems are a slowly spinning sun, the moon’s closeness to the earth, and a “chicken-and-egg” problem with star formation. The differences between what the Bible teaches and what the evolutionary perspective teaches are many and significant. It is impossible to reconcile the two explanations without twisting Scripture or rewriting the history revealed in Genesis. Note: Page numbers preceded by “T” indicate items from the teacher notes found in the margins of the Teacher’s Edition. According to the secular scenario, energy was gradually converted into matter as the universe continued to expand after the big bang. That matter accumulated and the first atoms began to form. The first stages of the naturalistic universe contained only energy. As the expanding universe slowed and cooled, hydrogen, helium, and small amounts of lithium were formed from the energy. The gases gathered into nebulae which then gave birth to stars and planets. As the earliest stars produced their energy through nuclear fusion, heavier elements were assembled and were eventually scattered into the universe as the stars exploded. These heavier elements accumulated in the universe over billions of years, and star systems with planets began to form. Star formation and stellar evolution have never been observed because they are supposed to occur over many millions of years. Evolutionists suggest that the stars form as gases (hydrogen and helium in the early universe) collapse due to gravity. As the nebula collapses, the gases heat up and the nebula spins itself into a flattened disk. One major problem with this scenario is that as the gases are heated, the pressure increases. This pressure would tend to cause the nebula to expand and counteract the gravitational collapse. To counter this problem, it is suggested that some type of “shock” overcomes the gas pressure at just the right time. This shock may come from the explosion of a nearby supernova or some other source. The problem has now become a circular argument. In order for the first stars to form, there would have had to have been other stars reaching the supernova stage to cause the first stars to form. So the argument may work for later generations of stars but it cannot explain how the first generation formed. If the first generation couldn’t form, then they could not have produced the materials and force for later generations to form. 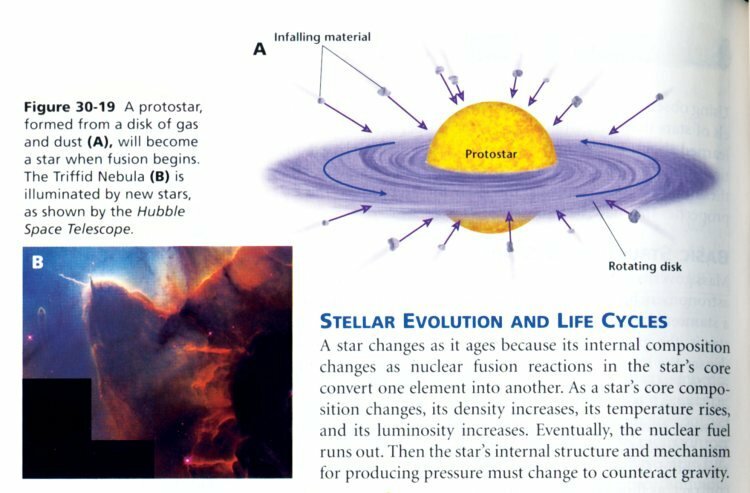 Setting the previous problem aside, evolutionists would then suggest that a protostar would form and continue to gain mass as it attracted nearby gas and particles. If the pressure in the core of the star increases the temperature to 10 million Kelvin degrees, nuclear fusion can begin and the star becomes stable. The stability comes when the inward gravitational force balances the outward gas pressure. Depending on the size and composition of the star, it follows a multi-billion year process until it consumes all of its nuclear fuel. At the end of its life it will either contract and become a white dwarf or explode in a spectacular supernova and leave behind a black hole or a neutron star. Our own sun is expected to complete this cycle in the next 5 billion years. This obviously assumes a uniformitarian progression of time and matter into the unreachable future. One uniformitarian belief presented in the textbooks is the formation of elements that make up the universe. The textbooks suggest that all of the matter in the universe is a result of the big bang. Atoms larger than hydrogen (with the exception of some helium and trace amounts of lithium which also formed from the energy of the big bang) are believed to be formed in the core of stars as a result of nuclear fusion. This process can only explain the presence of elements up to the mass of iron. It is suggested that the elements heavier than iron formed as a result of supernovae exploding. These elements were scattered into the universe and were eventually gathered by forming stars and planets. The formation of a protostar over millions of years from a spinning nebula has been proposed to explain the birth of new stars. There are many problems with this scenario and no explanation of how the first stars could have formed according to the known laws of physics. The Bible explains that God made the stars on Day Four. The heavier elements found on the earth were produced in a supernova and were collected as the solar system formed. This stands in direct opposition to the creation of the earth described in Genesis. The Bible presents the view that God created the entire universe, including each individual atom, out of nothing in six days, not from the constant process of stellar evolution over billions of years. The Bible teaches that the earth was formed on Day One and the stars on Day Four through the spoken words of God—the two ideas are quite opposite. The formation of our solar system is thought to be typical of other star systems in the universe. Around 5 billion years ago, an interstellar cloud of dust and gases began to collapse on itself as the force of gravity pulled the particles together. This scenario presents a problem. The force of gravity is pulling the particles together but other forces, like the pressure exerted by the gases in a balloon, are pushing the particles apart. Gravity is a relatively weak force, and this model has great difficulty in explaining how the stars and planets actually formed. 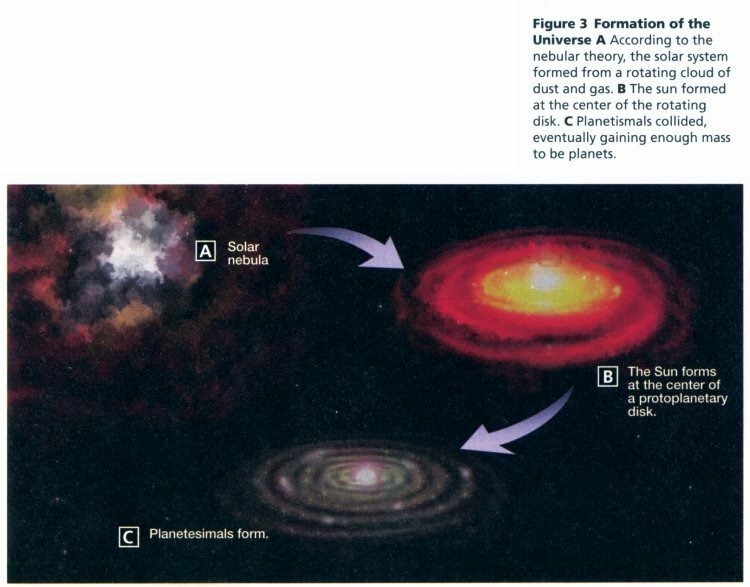 The model used by evolutionists to describe the formation of star systems is called the nebular hypothesis. Belief that the solar system formed from a spinning, collapsing nebula; the sun formed at the center with the planets forming at various distances. The idea was first put forth in the 1700s and has undergone minor revisions. Our solar system allegedly began as a nebula that began to spin and collapse due to gravity. As the nebula spun faster and faster, the protostar began to form (as described above) and a disk of dust and gases surrounded the protostar. The spinning nebular disk was warmer at the center than at the edges. Planetesimals began to slowly form as the dust particles stuck to one another. The nebular hypothesis is simply a story to describe what may have happened in the “prehistoric” solar system. There are no observations to support the claims that natural processes over millions of years could form a solar system. The Bible gives a clear description of the formation of the earth by the spoken word of God. The planetesimals that formed closer to the center of the disk contained the rocky elements like iron and silica that have high melting points. The lighter elements and compounds were blown away from the center and began to accumulate in the outer planetesimals. The outer planets are made of gases and ices as well as some rocky components. Over time, the planetesimals supposedly collided with one another or stuck together through gravitational attraction. As the collisions continued, the planets were born. Over time, most of the dust was gathered by the planets’ gravity, and the solar system became stable as the orbits of the major planets were established. Small dust particles and many asteroids still orbit the sun and are believed to be the leftover debris from the formation of the solar system. One of the biggest problems with this explanation of the solar system is that the particles of dust must stick together, known as accretion, to form the planetesimals. The stardust particles that are supposed to have formed the solar system would have just bounced off one another. The particles in the rings of Saturn offer a model for what would have happened in the spinning disk of the young solar system. If the particles were moving faster, they would still bounce off of one another or explode as they collided with great force. Again, the nebular hypothesis is a story of what must have happened even though there is no evidence in support of the claims. Another significant problem with the formation of the solar system is caused by the spin of the forming system. As more of the mass is pulled toward the sun, the mass must spin faster according to the Law of Conservation of Angular Momentum. This law is easily demonstrated. Sit on an office chair with your arms and legs extended and have someone spin you. Pull your arms and legs into the center and you will spin faster. This is similar to what should have happened to the sun in the nebular hypothesis. If the nebular hypothesis were accurate, the sun would be spinning much faster than it is. The sun has only 2% of the angular momentum and 99% of the mass of the solar system. To explain away this obvious problem, evolutionists propose a mechanism of magnetic field braking. The precise details of magnetic braking are still debated, but it must have happened for the nebular hypothesis to be accepted. The Oort cloud surrounds the solar system and may reach as far as halfway to the nearest star. Scientists think that the matter in the Oort cloud was left over from the formation of the solar system. Studying this distant matter helps scientists understand the early history of the universe. Bodies within the Oort cloud circle the sun so slowly that they take a few million years to complete one orbit. 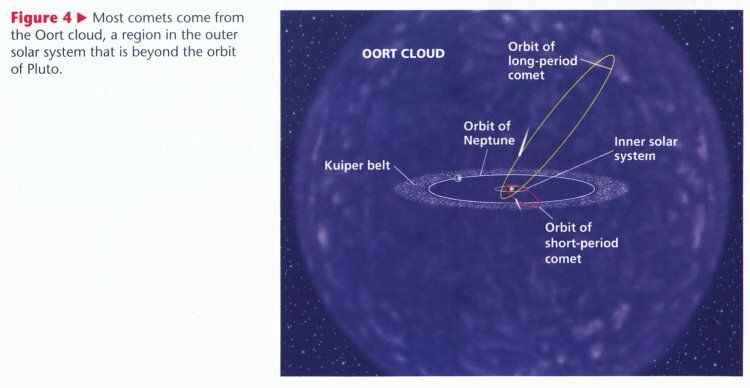 Despite never seeing the Oort cloud, we are told by the text that it surrounds the solar system, it has a huge size, was left over from the formation of the solar system, and its bodies take millions of years to orbit. All of these are “facts” that have been made up to fit the facts that are actually observed. So why is it necessary for evolutionists to invent the Oort cloud? If comets are remnants of the formation of the solar system, they lose their mass in a few hundred orbits, and the solar system is 4.5 billion years old, then new comets must be added to the solar system or we would not see comets today. The Oort cloud was invented by evolutionists to explain the existence of comets which should not be present in a solar system that is 4.5 billion years old. The comets fit easily within the biblical timeframe of 6,000 years. The problem is that this is an explanation based on zero observations and the assumption that the solar system is 4.5 billion years old. This is not a valid scientific model although it is accepted by most scientists as “the way it must be.” Comets confirm a young universe, not an imaginary cloud in the sky. The age and formation of the earth need to be addressed in a special way because earth is the planet that we live on. In the nebular hypothesis the earth formed as a molten mass in the early solar system. The heat was generated by many collisions with other bodies orbiting the forming sun. As the earth cooled, the materials separated into layers based on their density—the less dense materials near the surface and the more dense materials in the core. Once again, this is in direct opposition to what the Bible teaches. Genesis 1:2–6 makes it clear that the earth was created as a ball covered with water. In the naturalistic scenario, the oceans come much later, only after the earth has cooled over millions of years. 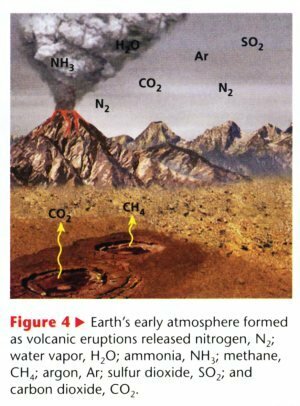 The textbooks explain that as the earth continued to cool, the atmosphere was formed and volcanoes released gas into the young atmosphere. The young atmosphere was supposedly composed of nitrogen, carbon dioxide, sulfur oxides, methane, and ammonia. The obvious missing ingredient is oxygen. Many evolutionists believe that oxygen was not a part of the atmosphere until hundreds of millions of years later when bacteria evolved the ability to photosynthesize. Through photosynthesis, oxygen began to slowly accumulate in the atmosphere. Evolutionists create a story about the earth cooling from a molten mass about 4.5 billion years ago. The pictures and stories are simply the products of imaginations that try to explain the existence of the earth without God. The Bible teaches a very different story and reveals an eyewitness account of the formation of the earth. So, is this one of the pages recorded in great detail or one very detailed speculation? The description given is based on the assumption that the nebular hypothesis is true and that life actually evolved from nonliving chemicals. If the nebular hypothesis fails then all of the subsequent explanations fail. This chain of assumptions is present throughout the naturalistic explanations for the existence of the universe. Based on the assumption that the nebular hypothesis is correct, the cooling molten earth released its gases into the atmosphere. Volcanoes and gas pockets are believed to have formed the early atmosphere that changed over millions of years. The Bible records a different history with the earth’s atmosphere created on Day Two. To add to the problems, the ozone layer must have formed from atmospheric oxygen before the first organisms could have evolved to produce the oxygen that formed the ozone layer. These types of contradictions abound in the naturalistic explanations of life evolving on earth. The last issue to deal with directly is the moon. The textbooks present a story of the collision of a Mars-sized object with the earth as the best explanation. The idea that the moon formed at the same time as the earth or that the moon was captured by the earth are mentioned as possibilities. The collision hypothesis is shown in detailed pictures that explain the process. The debris that was ejected from the impact eventually formed the new moon as it collected together. The rocks that were collected from the moon from the Apollo missions are dated at 4.5 billion years using secular assumptions. This makes the moon just as old as the earth in the evolutionary story. The Bible gives similar ages for the earth and the moon as well. Both were created about 6,000 years ago and only three days apart. In Genesis 1:16 the “lesser light” is created to rule the night and give light on the earth. We can trust God’s eyewitness account of how He did things over man’s conjectures about the unseen past. Claiming that the moon is 4.5 billion years old creates a major problem in the uniformitarian explanations. This is because the moon is slowly spiraling away from the earth at a current rate of 1.5 inches per year. That means that the moon was closer to the earth in the past. 6,000 years ago the moon would have been about 800 feet closer. Using the known rate of recession we can use calculus to determine the recession rate in the alleged distant past when the moon was much closer to the earth. This is necessary because when the moon is closer, the tidal bulges (and consequently the recession rate) are much larger. When we do the math properly, we calculate that the moon would have been touching the earth 1.5 billion years ago and would have been pulled apart before that by earth’s gravity. This is just another confirmation that the earth and moon cannot possibly be 4.5 billion years old. As we saw with the discussion of the big bang, there are many problems with the naturalistic explanations of the formation of our solar system. Many other problems are discussed in the articles that follow and the Tools for Digging Deeper. Because the naturalistic ideas are not based on the foundation of God’s perfect Word, they fall short. Below is a table that summarizes the major differences discussed above. It is, at best, inconsistent to believe in the Bible as the inspired, infallible, sufficient Word of God and accept that the big bang and the nebular hypothesis are true. Because the two views contradict one another on many points, they cannot both be accurate without twisting, reordering, or compromising one or the other. Will you trust God’s Word or man’s reasoning when it comes to the formation of the solar system? Pierre Laplace was a brilliant scientist during the 1700s who worked in mathematics, chemistry, and astronomy. Laplace was also involved in standardizing measurement systems. Laplace recognized great order in the solar system and suggested that it should exist indefinitely if the sun did not change. His notions were intended to refute Newton’s belief in a Divine Force holding all things together. Laplace hypothesized that the solar system was the result of a spinning cloud of dust that spun off rings of gas which condensed to form the planets. The remaining gas became the sun. A modified version of this theory is currently promoted by many evolutionists, but there are many problems with this model. Laplace assumed that there was a spinning cloud that contracted, but the known laws of physics cannot explain how such a cloud could contract since the force from gas pressure far exceeds gravity under normal conditions. Other problems include the opposite rotation of Venus, Pluto, and Uranus, and the slow rotation of the sun compared to the rest of the angular momentum in the solar system. Ultimately, Laplace’s model is based on naturalistic assumptions that cannot explain the formation of the solar system—a system that is the result of design by God. Psalm 19 tells us that the heavens declare the glory of God. But what do the heavens declare about the age of the universe? Recent observations confirm that the universe is only a few thousand years old, as the Bible says. A comet is a small, icy mass that orbits the sun and continually loses mass. The lost mass is seen as the two tails of a comet are blown off by the solar wind and the pressure of photons. Comets are also observed to break apart as they orbit near the sun and other planets. Since comets are constantly being eroded and destroyed, the solar system should contain no comets if it is truly 4.5 billion years old. To combat this challenge, uniformitarian astronomers have imagined an Oort cloud that is 50,000 times farther from the earth than the sun. The Oort cloud is supposed to provide the solar system with long-period comets, though there is not a single shred of evidence for its existence. Short-period comets are alleged to come from the Kuiper belt, but the objects in this disk are different from comets and cannot adequately explain the existence of so many comets in our solar system. Evolutionists would suggest that the moon has been dead for the last 3 billion years. However, frequent observations of color changes and luminous spots may indicate recent geologic activity. Since the moon is only thousands of years old, this activity is not unexpected. Both Jupiter and Neptune give off about twice as much energy as they receive from the sun. If these planets were 4.5 billion years old, they would have cooled considerably or they must have an internal power source that could keep them hot for billions of years. Secular models suggest that the cores of these planets are undergoing nuclear fusion, but there are many problems with those models. The energy contained in these planets, and the other young-age indicators, confirm their young age and the biblical account of their creation. The existence of planets around distant stars has been supported by the wobble produced as the planet orbits the star and the decrease in light from the star as the planet crosses in front of the star. Recently, astronomers have been able to measure the infrared energy from two of these planets, providing the first direct observation of extrasolar planets. The extrasolar planets discovered so far do not fit the nebular hypothesis of planet formation. The planets located close to the stars are supposed to be small, rocky planets according to the evolutionary model. The planets that have been found are very large and orbit too near the stars to fit the secular expectations. These stellar systems continually remind us of the diversity and creativity that the Lord displayed on Day Four. Uranus is a planet about 64 times the volume of the earth that orbits the sun at 19 times the distance. Uranus was discovered in 1781 but little was known about it until the Voyager 2 probe passed by it in 1986. At that time it was determined that the axis was tilted at 98 degrees to the ecliptic plane of the other planets’ orbits. The tilt of the axis cannot be explained if Uranus formed from the spinning nebula that was the supposed origin of our solar system. To explain the tilted axis, evolutionary astronomers claim that an earth-sized object must have struck Uranus to tilt it. This seems unlikely because Uranus has a very circular orbit that is very near the ecliptic plane—an impact would likely perturb the orbit. The small size of the moon and ring system, which are believed by evolutionists to be the remains of the impact, cannot account for the mass of the object that would cause the axis to tilt. Invoking a catastrophe to explain the unnatural features of Uranus is a bit hypocritical as evolutionists often criticize biblical creationists for using the Flood to explain earth’s features. Uranus also radiates little heat into space, unlike similar-sized Neptune. If the two planets formed from the same process, we would expect them to have similar properties. Another discovery of the Voyager 2 probe is that the magnetic field axis is tilted 60 degrees from the rotational axis and is much stronger than expected. These characteristics cannot be explained by current evolutionary models, though Dr. Russell Humphreys used biblical assumptions to predict the field strength two years before it was known. The many problems with the naturalistic explanation that are easily explained within the biblical framework make the creation of Uranus obvious. Neptune is a large gaseous planet that orbits the sun about 30 times farther than the earth. Little was known about Neptune until the Voyager 2 probe. Scientists did not find a cold, dead planet as they expected, but a planet with raging winds that gives off considerable heat. Another find of the probe was the tilted magnetic field with a strength that had been predicted by Dr. Russell Humphreys using biblical assumptions. The Bible reveals that Neptune was created on Day 4, but evolutionists have no way of explaining the existence of Neptune and Uranus. According to the evolutionary nebular hypothesis, the planets are supposed to have formed from the disk of dust and gas that surrounded the forming sun about 4.5 billion years ago. As the dust cloud spun, the particles allegedly stuck to one another. As larger particles collided, planetesimals formed. The planetesimals continued to collide and eventually attracted gases to form the outer planets. But is this scenario possible? Computer models of the nebular hypothesis have failed to show how such large planets can form so far from the sun. The time required is at least 10 billion years—double the supposed age of the solar system. This problem has been known for 30 years, but it continues to be brushed aside in the media and textbooks because scientists “know” the solar system formed by itself. Despite the lack of a satisfactory explanation, they cling to models that reject the Creator and the evidence of His creation. 3:6 Evolution vs. creation: the order of events matters! Many Christians believe that if we consider the days of creation in Genesis 1 as long ages we can harmonize the Bible with the big bang and the geological history promoted by scientists. This view is often called the “day-age” view and has many biblical problems. First, the text is intended to communicate that Creation occurred in six, 24-hour days. Second, this view requires millions of years of death and disease—consequences of the Curse after the Fall of mankind—before humans were on the earth. The old-earth view of the creation of the universe also assumes that science has proven the true age of the earth and universe. In fact, science has only interpreted the evidence from radiometric dating, distant starlight, and the formation of rock layers. Of highest importance is what is revealed in the text of Scripture about the order of events. Genesis 1 contradicts the evolutionary history of the universe and life in it at nearly every step. [See tables on page 52 and 77.] The Bible teaches that the earth was covered with water on Day One and at the time of the Flood while the evolutionary history denies that the earth was ever covered with water. Because of the many contradictions, there is no way to harmonize the Bible with man’s ideas about the evolution of the universe. We should trust the Word of God to reveal the truth about the events of Creation and earth’s history. This article provides an exhaustive discussion of the topics surrounding the origin of life. The discussion ranges from the presence of oxygen in the early atmosphere (despite the fact that it prohibits the formation of organic molecules) to the formation of DNA molecules and the complexity of the genetic code. Numerous evolutionary papers from scientific journals are used as evidence to support the idea that life could not have formed on earth by natural causes. 3:8 Did the early earth have a reducing atmosphere? Evolutionists assume that the early earth lacked oxygen because life could not evolve in an environment containing oxygen. If this were true, the rocks older than 1.9 billion years should contain no evidence of being formed in an environment with oxygen. Iron deposits from these rock layers indicate an environment with oxygen. The lack of sulfide deposits and the presence of sulfates and other oxygen-bearing compounds also point to an oxidizing environment. These and other evidences point to an atmosphere that contained oxygen from its beginning. Secular scientists have suggested that the oceans formed as rain slowly collected in basins after the molten earth cooled. The idea that this water was gathered from comets to fill the first oceans has been discredited by data from the Hale-Bopp comet. The comet was composed of deuterium-rich water. However, earth’s oceans contain very little deuterium. The Bible explains that earth’s oceans were created by God. 3:10 Lunar recession: does it support a young universe? Due to tidal forces, the moon is actually moving away from the earth at a current rate of one-and-a-half inches per year, but that rate changes as the distance changes. Calculating the distance between the earth and moon over time shows that the moon would have been touching the earth only 1.5 billion years ago—a big problem if the earth-moon system is 4.5 billion years old. Even before that time, the earth would have been within the Roche Limit of earth’s gravity and would have been pulled apart by earth’s gravity. If the moon is only 6,000 years old, as the Bible teaches, there is no problem to overcome as the moon would have been a mere 800 feet closer. 3:11 Have scientists discovered the moon’s origin? Evolutionary scientists have devised four major theories to explain the origin of the moon. The fission theory says that the moon split off from the spinning earth, but this is unlikely because the earth is spinning too slowly. The capture theory suggests that the moon was captured as it passed near the earth. However, it is more likely that this would throw the moon off into space and does not explain where the moon came from. Another theory suggests that the earth and moon formed next to one another, but there is no explanation for how the particles came together in the first place. The final theory calls for a collision between the earth and another object. The debris caused by the impact formed the moon, but there are many problems to overcome with this model as well. Despite man having traveled to the moon, there is still no satisfactory explanation of its origin from the evolutionary perspective. Scripture, however, clearly teaches that the moon was created suddenly by God. As more information is gathered about impact events in the inner solar system, uniformitarian scientists believe that there was massive bombardment around 3.9 billion years ago. The source of the material for the bombardment is not clear but may have been from the Kuiper belt or Oort cloud, but not likely from the asteroid belt. From the creationist perspective, there is debate over how and when the bombardment began and what the source was. The bombardment may have been involved with the Flood, as many creation scientists have suggested. Comparing the cratering events on the moon and earth can help establish when the event occurred. There are several creationist models to consider, and they can be examined against the physical evidence and biblical framework. Despite the problems in the uniformitarian models, the asteroid belt may be the source of the materials, and the event happened in the last several thousand years rather than 3.9 billion years ago. Comets are commonly used to argue that the solar system must be young. The basic argument is that comets lose material each time they orbit the sun, and there is a maximum of 11 million years for the orbit of a comet. Since comets are assumed to have formed from collapsing dust in the evolutionary models, the comets set a maximum age that is much younger than 4.5 billion years. Comets are large chunks of ice and dust that are heated as they pass near the sun. The sun’s radiation causes the coma to glow as particles are knocked off creating the two tails, which always point away form the sun. The straight ion tail is created as gases are ionized by the solar wind. The curved tail is a trail of dust pushed outward by the solar radiation. Comets have eccentric orbits and come in two types. Short-period comets have an orbital period of less than 200 years and usually orbit with the planets (prograde). Long-period comets have longer orbital periods and about half have a retrograde orbit that is opposite to the planets. Comets can also be lost by colliding with planets, as comet Shoemaker-Levi 9 did with Jupiter, or by being thrown out of the solar system by passing near a planet. If comets were part of the original solar system of 4.5 billion years ago, there should be none left in the solar system. To solve this problem, evolutionists look to the Oort cloud and the Kuiper belt as the source for new comets. The Oort cloud is a hypothetical shell of comet nuclei that surrounds the solar system. It is supposed that the nuclei are occasionally perturbed and fall into the inner solar system to become long-period comets. The Kuiper belt is a doughnut-shaped region, beyond the orbit of Neptune. There have been many objects identified in this region, and it is suggested that these objects are the source of short-period comets. However, the objects discovered in this region are much larger than comet nuclei. This challenges the assumption that the Kuiper belt is a source of new, short-period comets. If the solar system truly formed from a spinning nebula, we should see a high degree of similarity in the objects in the solar system. The sun contains 99% of the mass of the solar system but only 2% of its angular momentum. There must be a mechanism for transferring this momentum, but none has been rigorously demonstrated by evolutionary scientists. The axis of Uranus is tilted to 98° relative to its orbit around the sun. Many of its moons also orbit at its equator in the direction of rotation. These movements are the opposite that would be expected in the evolutionary model. Phoebe, a moon of Saturn, and Triton, a moon of Neptune, orbit in a retrograde direction as do several of the moons of Jupiter. A group of three moons orbits Jupiter at an angle of 30° from its equator—all contrary to evolutionary predictions. The crust formations and magnetic field of Mercury present problems for the evolutionary theory. Mercury is too small to generate a magnetic field in the way the earth is supposed to, so the model for earth’s magnetic field is not necessary to explain earth’s magnetic field. The facts are more consistent with a recent creation. The moon Titan has a nitrogen-rich atmosphere which contains hydrogen. This hydrogen could not be present for billions of years on a small satellite, so the gas must be constantly generated from within the moon through an unknown process. And how such a small satellite formed to retain methane, ammonia, and water is not understood. Ultimately the composition of our solar system points to the design of a Creator. The rings of Saturn have often been used by creationists to support a young age of the solar system. The rings are too delicate to have existed for billions of years. Observations from 1695 to the present have confirmed that the rings are shrinking. Recent data from the Hubble Space Telescope has prompted evolutionists to suggest that the rings may be as young as 30 million years old. To create the young rings, it is suggested that a small moon or passing comet was destroyed—an extremely unlikely event. Despite the evolutionary interpretation of the relatively young rings, the rings are a beautiful part of God’s creation. Many characteristics combine to make life on earth possible while the conditions on other planets make life impossible. Mars has an extremely cold surface with no liquid water known on the surface. Water is believed to have once flowed on Mars’s surface, but it is hard to explain how this may have happened on such a cold planet. Since the sun is powered by the fusion of hydrogen, it could burn for about ten billion years—about half of that time having already passed in the evolutionary view. As the composition of the core changes, so does the intensity of the light. The sun should be 40% brighter today than it was 4.5 billion years ago. This would impact the temperature of the planets. Evolutionists must explain how life evolved on a planet that would likely be frozen—an apparent paradox. Changing atmospheric composition with a complex feedback system is generally used to explain how the paradox is avoided. As new forms of life evolved, the earth’s atmosphere evolved along with it. The precise tuning of this process would have been nothing short of miraculous and has been called the Goldilocks syndrome. Evolutionists have two ways to explain this. They can accept that it happened as a chance occurrence as the sun, atmosphere, earth, and living things all evolved together, or they can accept some type of guiding force that accomplished the task. The third possibility is that the sun and earth are only thousands of years old and that there is no need to explain the paradox at all. If the earth and sun were recently created for life, there would be no conflict. The young faint sun paradox seems to rule out the idea that the solar system is billions of years old. 3:17 Proof of life evolving in the universe? Many reports of water vapor and carbon compounds found near distant stars have led to claims that life must have evolved elsewhere in the universe. Evolutionists assume that there are planets similar to earth where life may have evolved, but they still cannot explain how life evolved on earth. The presence of conditions similar to earth does not prove that life has evolved elsewhere. The answer to the question of the origin of life is found in Genesis—the Creator made life on earth. If there is no evidence to support the existence of the Oort cloud, then how can it be considered a scientific hypothesis/theory? How do scientists explain how a nebula collapses on itself when the laws of physics show that the heat and pressure would cause it to expand? How do scientists explain the slow rotation of the sun with respect to the rest of the solar system? What are the problems with the formation of the moon from an evolutionary perspective? How can the retrograde rotation of planets and orbits of moons be explained in a naturalistic way? Have the discoveries of extrasolar planetary systems confirmed the nebular hypothesis predictions? The New Answers Book by Ken Ham et al. 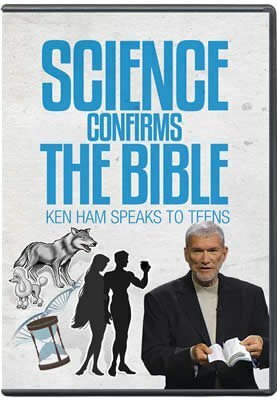 The New Answers Book 2 by Ken Ham et al. 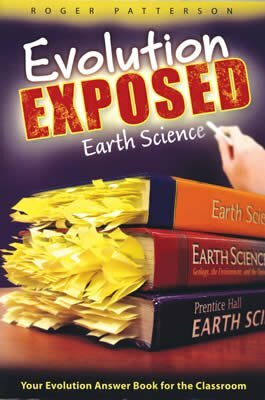 In this follow-up to the best-selling Evolution Exposed: Biology, students will learn how to respectfully counter the evolutionary bias and indoctrination in astronomical and geological evolution.